Line6 XD-V70Several weeks ago, a friend of mine dropped off a review unit of the Line6 XD-V70 for review. If you're not familiar with it, don't feel bad. Line6 is well known for their guitar pedals, amps, guitars and the like, but not so well known for wireless mics. 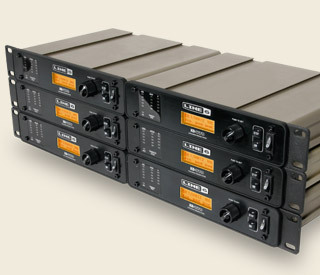 And in fact, this line of wireless mics has grown from the Line6 acquisition of X2 Digital back in 2008. The V70 has some very intriguing features, and sells at a very aggressive price point (around $499). But how does it sound? If you're the impatient type and can't wait for the ending, here's the spoiler; it sounds really good. Now let's consider what we're looking at. The receiver is made from extruded aluminium and takes up a half rack space. The front panel contains three LED bar-graph meters; one each for audio level (plus an LED for mute status), battery and RF level. Next to that is a nicely backlit LCD display showing current channel, battery life (in a convenient hours:minutes format), and signal strength for each antenna. A clickable knob navigates through the menu items while a set of bottons enter and exit the menu system. Finally there is a front-mounted power switch. Missing from the receiver is a headphone jack, which is kind of a bummer, but not unexpected at the price point. The back contains the usual 1/4" and XLR balance out connections, A&B antenna jacks plus (and this is unusual for mics at this price point), built in antenna distribution. Using include short BNC jumper cables, you can attach the very sturdy 1/2 wave antennas to one receiver, then connect the rest together. Just be sure to use the included terminators at the end of the chain (or on a single receiver if not distributing). Self-terminating loop through BNCs would have been a nice touch; this is a common feature on video monitors. Overall though, this makes for a much cleaner, and more effective installation if using multiple mics. As I said, the receiver is a half-rack space and includes a few cool physical features. There are a set of groves formed into the top, bottom and sides of the receiver that accept included bow-tie shaped plastic spline. These splines are used to join multiple units together either for stacking or rack mounting. Each system includes two splines and a rack ear. Buy two and you have everything you need to rack them up (you can also rack mount a single system with the included spacer). It's a very elegant system. Those grooves in the top accept the bow-tie shaped splines.Speaking of multiple mics, the XD-V70 system allows for up to 12 channels in a room. While it might be possible to get significantly more channels of analog in a given room, that require a fair amount of frequency coordination and care to make sure they all work. Line6 says you will be able to use all 12 channels every time, without interference. The XD series operates in the 2.4 GHz range, and utilizes some pretty trick digital spread spectrum technology to get the signal from the transmitter to the receiver in one piece. Simply put, the signal is split up to four frequencies, transmitted and re-assembled at the receiver. It's also encrypted, so there's no worry of people snooping in on your live sound reinforcement. Now, because I've been really busy, I didn't take the time to do a full blown measurement test to see how accurately they modeled the mics. I can tell you that switching between the models does indeed change the sound, as well as the pickup pattern. We have over half those mics in our mic locker and from some very cursory testing, I can tell you that the models are close. Even if they are not exact, most of us realize the benefits of matching the mic to a vocalist's voice; the XD-V70 makes it easier to get a good match without spending a ton of money on replacement capsules. Might the actual capsules sound better? Maybe, but the fact remains that being able to switch quickly between mic sounds for a vocalist is a huge boon to the smaller, cash-strapped church (or the busy sound guy). The transmitter feels pretty good in the hand, being made from an ever so slightly textured plastic. It may not be as rugged as a UHF-R, but then the entire system costs less than a UR2. Getting batteries in and out is super-easy, and rechargeable cells fit perfectly (something that can't be said for UR2s sometimes). I haven't been able to do a full range check; however Line6 advertises a 300 foot range. We've not had a single RF dropout since we've been using it over the last 4 weeks, with ranges up to 100' and a lot of other wireless in the room. And then there's the sound. Because it's digital, the transmitter is capable of sending 24 bit audio from 10 Hz to 20KHz with a completely flat frequency response (according to Line6). 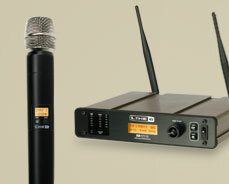 The system also uses no companding (the combination of compression and expansion that every analog wireless mic uses to minimize bandwidth use). Those two traits show. The sound is amazingly clean and direct, sounding very much like a wired mic. Since we multi-track our band every week, I listened to samples (which come right off the mic pre, remember) of the same vocalist singing into a Shure UHF-R with a Heil RC-22 capsule and into the V70 with the mic model set to the N/D 767. Even when listening with my UE7 custom-molded monitors, I was hard-pressed to hear a difference. The UHF-R may have had slightly more detail in the 2-3KHz range, but it was really close. The UHF-R has an excellent companding circuit which results in very few noticeable artifacts, so it's a good reference. The Line6 was similarly free from any compression or overloading. As I switched back and forth between the two mics, it was so close as to be academic. In almost any PA in the world you probably wouldn't notice the difference. This mic system has a lot going for it. It's aggressively priced, and arguably better sounding than any of it's competitors in the price range. In fact, it sounds almost every bit as good as a system priced at 4 times the XD-V70, which is a pretty significant accomplishment. While it lacks some high-end features such as networking, it does include antenna distribution—which is arguably more useful. Line6 sells paddle-style antennas for use in more challenging environments as well. The digital mic modeling is very intriguing, and as we regularly swap capsules on our UR2s for different vocalists, it would be nice to just click through a menu to accomplish the same thing. Battery life has been really good; we've run them for nearly 7 hours without a hiccup (Line6 advertises 8 hours on a pair of alkaline AAs). I guess deciding whether these mics make sense for you will depend on your needs. There's a part of me that regrets spending what we did on our UHF-R system. On the other hand, we can easily rent additional components and expand our system to over 24 channels (which we'll be doing in a few weeks for Christmas). But if I didn't think I would ever need more than 12 channels (and that's a lot of churches), this starts to look really tempting. I've not had much experience with Line6 to know what their customer support is like, and surely they are a relative newcomer to the wireless mic space. On the other hand, they've been making wireless guitar packs for years. The system is certainly good enough that I've used it for 4 sets of weekend services without complaint, and it's kept right up with the UHF-R. So that's something!